I got my box today from Kittensquid. Thank you so much. Every thing in my box was super special! First: Here is a picture of the inside of my box. There were some awesome stickers all over my box too. Here is what was inside the box. I love my little owl ornament and this Bushwoolie is one I have wanted for so long. I got some super cook tins. The little one has a magnet on the bottom and you can stick it on the refrigerator. The tiny bracelet has little animals that look like cows on it. 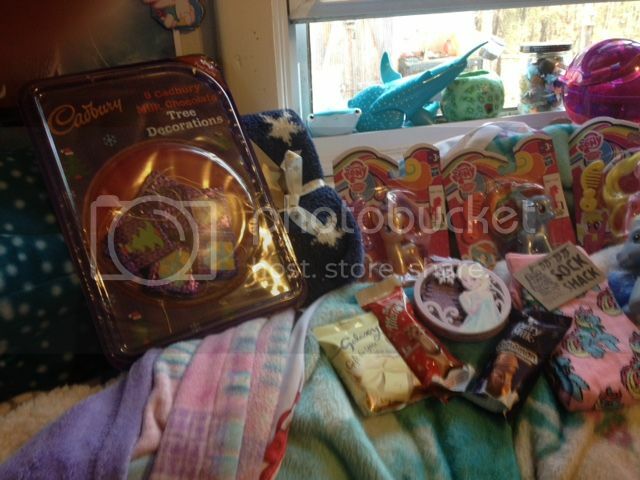 Wonderful yummy box of candy and a fun Disney item featuring a Cheshire Cat themed cupcake. The best combination of goodness ever..oh and a little compressed fox washcloth. Really pretty card too. Here is an up close photo of my pony and Friendly. The Christmas tree lights make them look like they have spots but they don't lol. They are just enjoying the pink Christmas lights on my mini tree. I am soooo glad you liked everything! I thought you'd enjoy some cows from the dairy state! I hope the pony is good enough for your collection, it seemed like everyone was selling literally every pony but the ones I wanted to get you! And the box you sent me is way too awesome! I will try to have pictures up tomorrow, you outdid yourself! Well, @kittensquid just look at her under that tree. She is sparkling pony happy if you ask me. I know how that is. 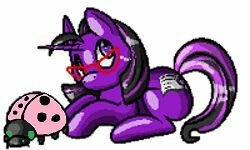 I have had a hard time with swap lists before where every pony I needed wasn't available. Oh I am so glad you got your box and like it. I hope you didn't have any of the items I stuck in there. LOL I did go a little crazy ROFLOL. If I get a partner with a similar interest as me I have so much fun. Oh I was going to tell you I just loved the colors you used in my box. Perfecto!! Sounds like a very cute box. I like your bushwoolie Friendly he was the first one I got from a swap long time ago. Aww, you're so kind! I just love all the Tsum Tsum goodies and the Monster high mystery figure in a bag was so cool! I've never seen those before. Btw, you and I like the same colors, that was so fun! So here are all the goodies in their cute gift wrapping. I'll have you know I put those pretty candy canes on my tree right away! And here they are unwrapped! I just love everything! And my cat, Science, was a really big help. 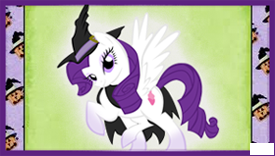 Seriously, those are some of the prettiest ponies I have ever seen! And I just love the little possum so much, she' stone straight into my curio cabinet! Thank you so very much, Tulagirl! Great boxes! I love all the tsum tsum goodies @kittensquid. Is that a Stitch lip smacker I spy, I love them, never seen a Stitch one before, is it blueberry flavour? wow another box super awesome. I love your hello kitty goodies. I always been a big fan of her. Your ponies are very cute. Your teeny tiny pony is adorable. I like your tsum tsum even if I dont collect them. I see them all the time at walmart. @icecreamgirl it is blueberry! I am beyond thrilled with all of the awesome goodies! 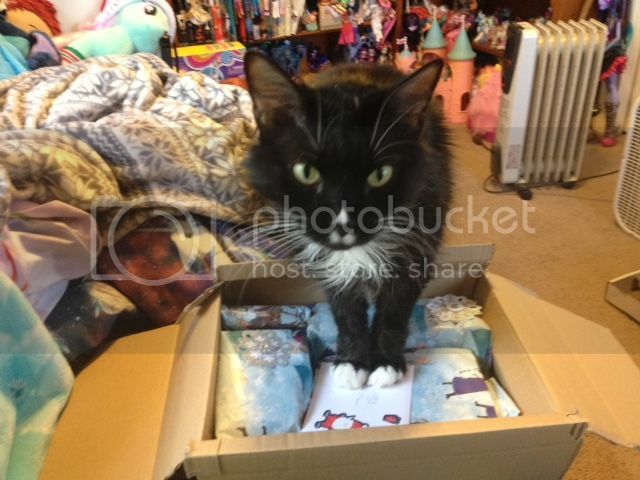 Love your box How did @tulagirl send you a such a cute CAT??? I kidd I kidd lol. 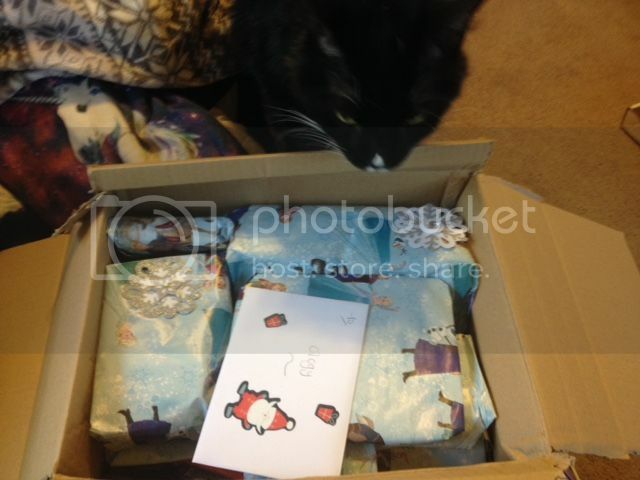 but very cute box and cute kitty as well. oh doofus me..the real cat....at first I thought you were talking about the card I drew her. I am so brain dead today. Thanks, @Ology she loves when people tell her that she's pretty! And the card is lovely too, it's probably my favorite Christmas card I've gotten this year! I got both my boxes! Yay I can't wait to see some more brags. Thank you for the box @icecreamgirl so much. My lovely assistant Jazz ( yes name after the Autobot if you don't know and yes he has the triforce of power on his nose lol ) of course had to help. Can you believe this boy just turn 9 time flies. He like Momma I want the box get this stuff out of it. I got three kinds of chocolates, ornaments that are chocolates, A frozen Elsa ornament so pretty, Fuzzy Fuzzy sock I love sock ( inner Minty squee). My ponies were the pearly G4 Pretzel, Cherry berry, Rainbow Dash, ( now if the rest would he down my way I be so happy) they are really pretty. I got a G3 Silver Glow thank you for that. Cute pins of penguins with Santa hats they say there from a cancer charity if so that rocks I support all cancer charity. I loss two grandparents and my aunt to it. I put them on my hat. GODS I LOVE PINS. I got a nice card as well. Looks like you got some nice stuff very cute box I love your new G4s the pearly ones are so awesome. I picked a Pretzel from my daughter. Oo I need to gather all the stuff that Oolgy gave me to show off now! Pretzel is pretty and Brushable wise I have not seen a brownish pony before. 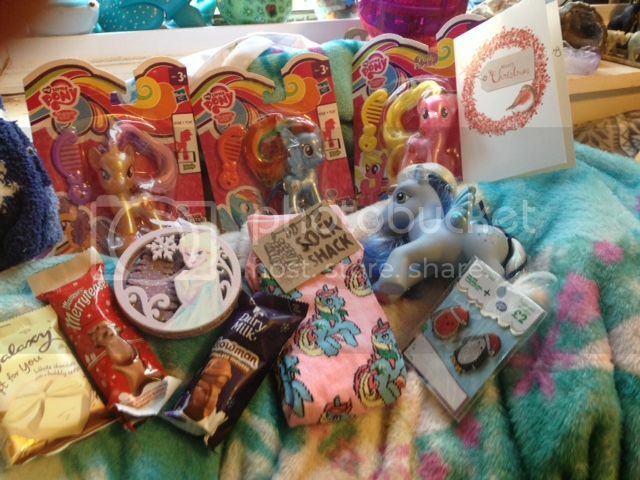 I love all the stuff I am sure you daughter will love her pony. Yeah I hope to give it to her for her birthday. What a delightful box Ology. It is fabulous, beautiful ponies, great extras. Pins which I know you love, the socks are fantastically ponylicious too.